BUILDING APARTMENT BLOCKS in Ireland is “a challenge from a cost point of view”, according to Housing Minister Eoghan Murphy. Despite this being the case, there needs to be a ramping up of apartment developments if the government is to get on top of the housing crisis. “If we are to resolve the current housing shortage, as well as to plan smartly for our future under Project Ireland 2040, we need to build thousands more affordable apartments in our urban centres,” said Murphy. The minister has claimed the cost of building apartments has dropped by as much as 15% due to policy changes and apartment standards he introduced before Christmas last year. In a bid to increase apartment building in the capital, and reduce costs, the minister announced a raft of new guidelines around apartment developments last December. These included getting rid of mandatory car parking spaces in apartment blocks, an increase in high-rise building, fast-track planning permission for large-scale developments, as well as more apartments per floor. A report by an independent working group reviewed the minister’s overhaul of apartment development regulations implemented to date and found it has had an impact. Looking at one example, the working group said the updated apartment planning guidelines achieved a greater number of apartments on a city centre site of a six-storey development where “demand is greatest”. This is just one of three reports Murphy published today – one of which reviewed the cost of delivering residential units. It showed that building residential properties is “not as attractive an investment opportunity” for builders. It also found that it is “extremely challenging” for builders to construct apartments in urban centres, while suburban housing developments or housing estates were found to be “marginally viable”. The calculations were based on houses and apartments priced on an “affordability range” of between €240,000 and €320,000 (the report states these figures are based on Central Statistic Office earnings data and Central Bank rules). Taoiseach Leo Varadkar recently said he welcomed the sight of cranes in Dublin’s skyline, but said he was concerned that construction of hotels and student accommodation appears to be overtaking that of houses and apartments. This latest report seeks to address the reasons as to why the building of commercial property, over that of homes, is seen by builders as a better return for their cash. It investigated all costs related to delivering housing for Ireland (the government wants to build in excess of 25,000 units per year) such as construction costs, land, fees, development levies/contributions, finance costs and VAT. It also investigated the scarcity of affordable homes, which has “become a significant concern and a matter of priority”. 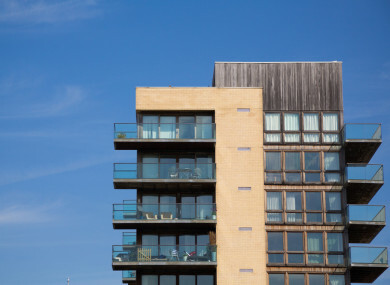 The report finds six-storey buildings are “optimal” from a cost point of view and highlights the need for a higher number of one and two-bed apartments. The skills shortage in the construction sector is blamed as a leading cause to wage inflation, which is driving up costs for construction companies. Access to the cost of finance for residential schemes “remains a significant challenge” and is a substantial factor increasing development costs, it states. One of the three reports also makes a number of recommendations – such as calling on the government to better utilise State-owned land. It recommends that certain lands in State ownership (of which over 730 sites have been identified as potentially suitable for residential development under the Rebuilding Ireland plan), should be used ”strategically to help stimulate residential delivery at more affordable pricing levels, particularly in Dublin”. This key recommendation calls on the government to co-ordinate an experienced, strategic management team to tackle the State land portfolio and ramp up building on the affordably priced land. The State has also been urged to increase the number of social housing projects. While the report notes there has already been some State investment in a number of companies who are focused on delivering private housing, it highlights that such supports are encouraged “in respect of up-front payment” for social housing schemes under Part V.
Part V of the Planning and Development Act, introduced more than a decade ago, ensures that every developer sets aside a percentage of each development for use as social housing. Builders have been arguing that the cost of VAT is driving up costs and have called for it to be reduced (something Fianna Fáil has also called for in the past). However, the report concludes that under EU rules, a reduction is “not achievable” and predicts it would only result in further increases in land prices. The third report looks at how Ireland compares to other countries when it comes to residential construction. It finds that Ireland has comparable construction costs for residential buildings with the UK, Germany and France. “Ireland is not out of step with countries,” it states. Minister Murphy said each of these reports is important in terms of analysing key elements of our housing sector as well as providing robust responses. Rebuilding Ireland is an ambitious programme containing a number of initiatives to restore and remake our housing sector, as well as to find sustainable solutions for those in emergency accommodation or sleeping rough. This will continue to be a priority for Government as Rebuilding Ireland continues to make progress. Reacting to the release of the three reports, Sinn Féin’s Housing spokesperson Eoin Ó Broin the department has confirmed that the market cannot deliver genuinely affordable homes and that State land should be used to deliver more residential units. “Social and affordable homes for rent and for sale should be delivered on State lands by local authorities. Not by public private partnerships, not via land initiatives and certainty not to private developers with no iron clad contractual commitments on affordability,” he said. “Unfortunately the reports definition of affordability at between €240,000 and €320,000 immediately blocks access to homeownership for people who earn above the income to qualify for social housing and whose average household income is between €45,000 and €75,000. These people are now trapped in the volatile private rented sector,” added Ó Broin. He said he has written to the Oireachtas Housing Committee to request a meeting be held to discuss the content of the reports. Email “Minister: 'To solve the housing crisis, we need to build thousands of affordable apartments' ”. Feedback on “Minister: 'To solve the housing crisis, we need to build thousands of affordable apartments' ”.